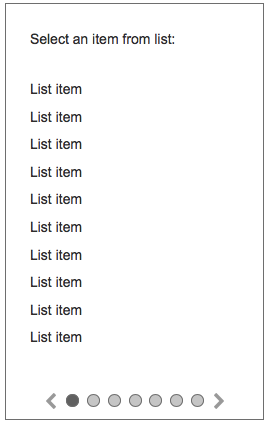 but instead of 3 list I have 7 and some lists have more than 20 items to choose. I like the idea of showing the next list only after a item is selected. The problem that I have is the layout. It takes too much horizontal space if more than 4 items are selected. Is there any other way to organize this? I don't like a lot the accordion solution, because only two first selections are required and I have to create accordion options dynamically. It isn't a web app and interface components are hard to code. The use case isnt completely clear, but if a cascading menu isnt appropriate due to horizontal real estate - maybe you can use a wizard like approach and change the panel's contents based on the current step. Selecting an option on the list will advance the user automatically to the next step. You should provide the user an option to go back in steps and change the selection, but future steps will not be available until all steps before have been completed. Not the answer you're looking for? Browse other questions tagged lists selection hierarchy or ask your own question. How to make the relationship between two related lists more obvious?